For grinding processes the actuated variables (e.g., cutting speed, feed velocity) and the system variables (e.g., grinding tool properties) have to be distinguished from the grinding parameters. The grinding parameters depend on the actuated and system variables and allow a good correlation to the process forces, process temperatures, surface roughness, and grinding tool wear. The most important grinding parameters, that are described here, are the material removal rate Qw, the material removal rate per unit active grinding wheel width Q′w, the geometrical contact length lg, the kinematic contact length lk, the equivalent chip thickness heq, and the medium single-grain chip thickness hcu. The grinding process is a geometrically undefined cutting process due to the undefined number and geometry of cutting edges interacting with the workpiece. The load on the workpiece as well as the load on the grinding wheel is a result of the programmed actuated variables, the cutting tool properties, and the workpiece properties. Due to the complex interrelationships in the grinding process, the parameters have been defined to describe the process behavior. These parameters are described in the following entry (see also standard ISO 3002–5 1989). 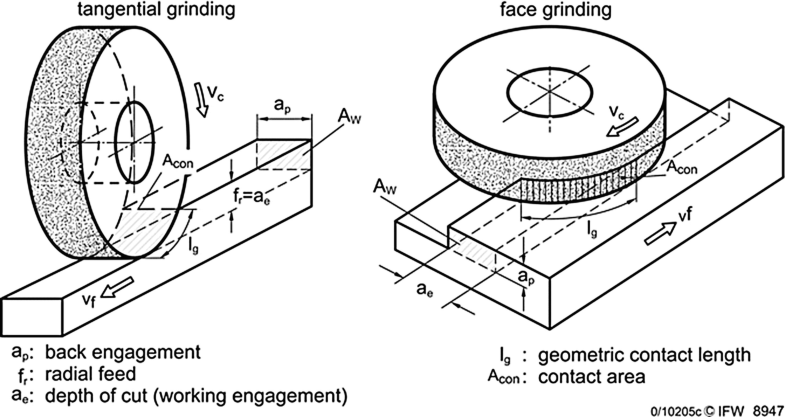 The basic process parameters in grinding processes are the cutting speed vc, the feed velocity vf, the depth of cut ae, and the width of cut ap (see Fig. 1, see also Denkena and Tönshoff 2011). The cutting speed is in general equal to the circumferential speed of the grinding wheel. 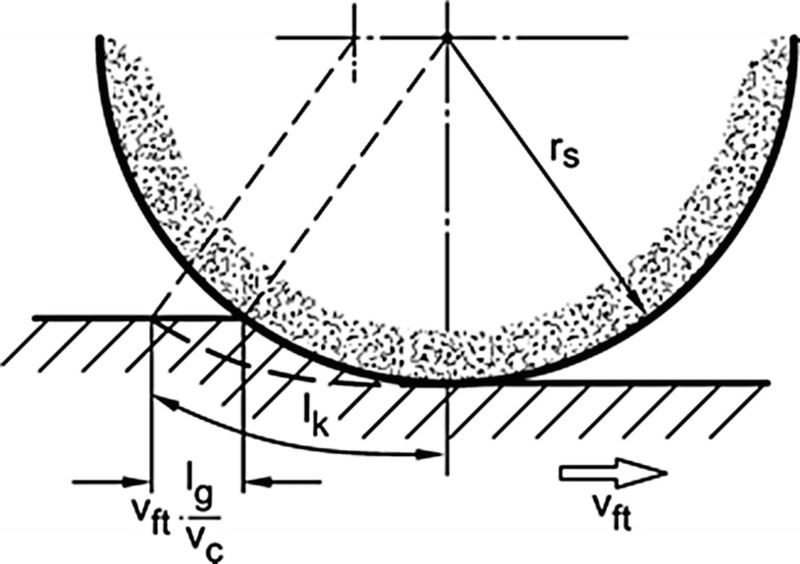 The feed velocity is oriented in feed direction. The feed direction in grinding processes can be oriented in tangential or axial to the grinding wheel. For this reason, the tangential feed velocity vft and the axial feed velocity vfa have been defined. 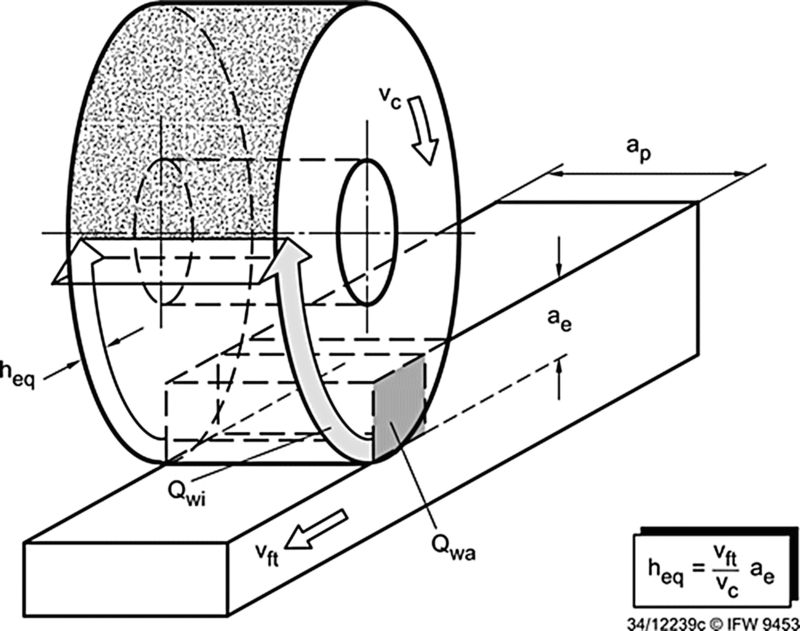 In cylindrical grinding, the feed velocity can also be oriented radial to the grinding wheel. In this case, the radial feed velocity vfr is defined. Depending on the grinding process, also the workpiece can have an actuating velocity which is not in every case equal to the feed direction. This velocity is then called the workpiece velocity vw. The depth of cut ae is the engagement of the grinding wheel in radial direction, while the width of cut ap is the engagement of the grinding wheel in axial direction. For this reason, the depth of cut ae is also known as the working engagement, and the width of cut ap is known as back engagement (Fig. 2). Further parameters relevant for grinding processes are the width of the grinding wheel bs, the width of the workpiece bw, and the diameter of the grinding wheel ds as well as for cylindrical grinding the diameter of the workpiece dw. In general, the material removal rate can be calculated by the actuating cross section Aw, which is the cross section between tool and workpiece orthogonal to the feed direction. A general overview on the process parameters and the calculation of the material removal rate for these processes is given in Fig. 1. The geometrical contact length is a mathematical value which does not consider the kinematics between tool and workpiece, the elastic deformations as a result of the grinding forces, the roughness of tool and workpiece, and the real contact conditions between the single grains and the workpiece (appr. 1% of the geometrical value). The kinematic contact length lk considers the feed and cutting speed for ideal even surfaces. It can be calculated by (see Fig. 3). while the parameter q is the speed ratio vc/vft. Kurrein also defined the external material removal rate Qwa, which can be calculated equal to the material removal rate Qw (Kurrein 1927). Every grain is cutting actively. Every grain has the same protrusion height. 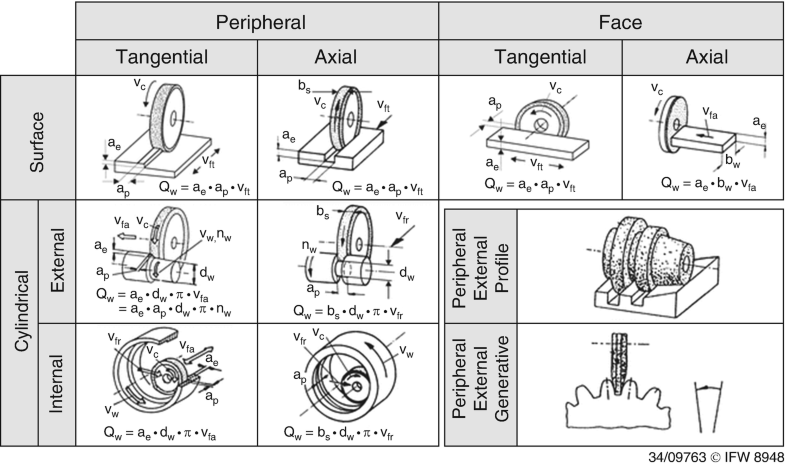 Elastic and plastic deformations are not considered. The path overlap is not considered. Lambda is a factor that describes the shape of the grains. The number of active grains in the contact area NA depends on the geometric contact area as well as the grain size and the grain concentration in the grinding wheel. This means that the medium chip thickness per grain depends on the grinding wheel properties as well as the actuated values. The medium grain chip thickness can be increased by increasing the feed rate, the working engagement, the grain size, and the grinding wheel radius or by decreasing the cutting speed and the grain concentration in the grinding wheel. Several results show that the values contact length as well as medium grain chip thickness show a good correlation to the process results tool wear and workpiece properties (Brinksmeier 1991; Lierse 1998). An increasing contact length leads to higher temperatures in the contact zone and though to a higher tendency toward grinding burn. A higher medium grain chip thickness leads to a higher mechanical load on the grains and though to a higher tendency toward grain breakout and to higher wear rate. Furthermore, a higher medium grain chip thickness results in a higher workpiece roughness. With this knowledge, the grinding process can be optimized regarding tool wear, workpiece properties, and productivity.